Over the past ten years we've recorded COUNTLESS commentaries on the current state of radio ... some times more "biting" than others ... but ALWAYS with the intention to CHALLENGE and MOTIVATE today's oldies programmers to "take the blinders off" and look beyond those same 200-300 songs that every other station in the country is playing. If one were to ask me, "Is Oldies Radio Better TODAY than it was ten years ago when Forgotten Hits first began", I would have to answer "Yes" ... and, hopefully, we've helped to play at least SOME small role in that. Radio has expanded through much more free-form programming thanks to the Internet ... and now, with Wi-Fi Radio as the next big step (we've watched the rise ... and fall ... of satellite radio during these past ten years, too! ), we are encouraged that things are only going to get better. As more and more terrestrial stations throw in the towel, the field is widening for those radio entrepenaurs willing to give their listening audience just a little more credit ... yes, we really CAN digest more than those same "tried and true" oldies ... and yes, we really DO remember MANY more songs from our youth. If you will INTELLIGENTLY present them to us (without all the "adult diaper" / "erectile dysfunction" / "incontinence" ads), we WILL listen!!! History has shown that in tough economic times, radio has ALWAYS been a salvation ... it's "free" entertainment that can be enjoyed at home ... but we've squeezed and syphoned all the personality out of radio for SO long now by introducing more and more automation that the CONNECTION an audience used to make with those on the air that we listened to has all but disappeared. The "art" of radio is gone. Did you hear this story ? And, a day after Citadel filed for bankruptcy, so did Next Media!!! Our whole radio world is changing! Like Citadel, this is a debt-for-equity exchange, though the first-lien debt and general unsecured creditors will be paid in full. The creditors in line behind them will have their debt converted into 95% of the equity in radio-and-outdoor firm NextMedia. The company will emerge from the plan with debt of about $128 million. It operates radio stations in the Carolinas, Texas, California, Wisconsin, Michigan, Ohio, and the area around Chicago. Unlike Citadel Broadcasting, NextMedia is privately-held, though it once tried to go public through an initial public offering. More now at Radio-Info.com. ::sigh::: Remember when Chicago radio was the best thing ever? On Friday January 1 (New Years Day) I will have two special country segments besides my assorted oldies. At 9 PM, I will be interviewing Diane Diekman, who has written a book about Faron Young. She is also working on a book on Marty Robbins. This should prove to be something not to miss. At 12 AM I will be doing a tribute to the late and great Hank Williams on my "Midnight Country" portion of my show. Don't miss this special evening as we start off the New Year. The Pop Shoppe has been on the Internet on topshelfoldies for 8 years. Got this posted with plenty of notice ... thanks, Stu! 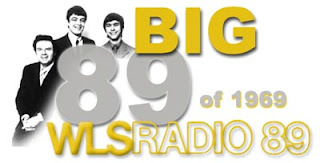 Just so your listeners / readers know, Uncle Ricky will be playing the replay aircheck of the Big 89 of 1969 on its' 40th Anniversary Year on New Years Day! It's eight hours of great music and the DJs we grew up with and loved! The New Colony Six are well represented, too. IF they play the Art Roberts hour leading up to the countdown (and I believe after the show, too), you'll hear my fave "Barbara, I love You" and the NC6 are IN the countdown and a greeting from Ronnie Rice himself around #20 in the countdown!! The Big 89 forever!! Also, Christmas brings us Holiday jingle Samplers, Cousin Brucie Christmas and WNBC Christmas shows!! Linda November and Artie Schroeck are on my next radio interview show! Some of you may look at these two names and say "who are they"? Linda November and Artie Schroeck may not be household names but they are two of the most respected people in the music business. And almost everyone on the planet is familiar with some of their work even if they are not familiar with their names. Hopefully this show will give these two "class acts" -- who also happen to be wife and husband -- some well-deserved long-overdue public recognition. This super-sized show -- 80 minutes -- covers a lot of ground but it barely scratches the surface in conveying the extent of what these two have accomplished. I may suggest to them that we do a second show or even a mini-series some time in the future! Artie has written songs and arrangements for a veritable "Who's Who" of the top names in the business. Just to name a few: Frank Sinatra, Paul Anka, Neil Diamond, Liza Minnelli, Petula Clark, Sammy Davis Jr., Barry Manilow and the Cowsills. He was the co-writer of one of the most admired Frank Sinatra songs entitled "Here's To The Band." Possibly Artie's most famous arrangement was also his most commercially successful. It's an artist that I have yet to mention. Artie arranged "Can't Take My Eyes Off You" for Frankie Valli and did other arrangements for the Four Seasons as well.This interview show is chock full of fun and surprises. It was such a joy doing it. Oh, one other thing before I list the tracks. This was the first interview that I did using "Skype." I was able to see Linda and Artie on my computer monitor while I was talking to them! For me it had the feel of being an "in-studio" interview. Following are the tracks on the show in sequence. Most of the "excerpts" (except the "Meow Mix" opening excerpt) are about a minute long. Those listed as "edits" contain more than half of the recording. Milwaukee – The label on 95.7 is once again “Oldies”, with Clear Channel ditching WRIT’s “My 95.7” approach for a plain-spoken “Oldies 95.7.” The station’s been classic hits and now is adjusting by leaning on the 1960s and 1970s. New slogan – “Milwaukee’s only oldies station.” The Wisconsin Board is talking “oldies” now. We've been hearing for months and months now that Hit Parade Radio has hired Larry Lujack but when I go online all I hear is music. Apparently per your blog the format will change during the 1st quarter of 2010. Please please please let us know when Uncle Lar will start broadcasting and at what times of the day, too. Frankly speaking, there are thousands of internet oldies stations out there, and most of them seem to be playing a lot of the same boring music. Hit Parade Radio runs the risk of just becoming another one of them ... however, adding Lujack and Martindale should change that. Whenever I've tuned in, I've heard drop-ins by both Martindale and Lujack ... but as more of a "promo / sampling" nature about what's coming up rather than as an actual radio broadcast ... the purpose here is to let folks know about the new station and what kind of music they can expect to hear. Internet Radio has been able to offer more variety in programming because most of these stations are independently owned and operated ... heck, SOME of these guys are literally broadcasting out of their bedrooms!!! ... and this new-found freedom and expansion has benefited the oldies music fan in that we get to hear something OTHER than the same old, same old typically being broadcast by terrestrial radio today. Let's face it ... a few short years ago, a number of major conventional radio markets had already given up on the oldies format ... thanks to guys like Scott Shannon and The True Oldies Channel, nearly 100 cities are now enjoying their oldies again ... but it's tough to program a station like that for "mass-market" listeners, especially when you've got people to answer to ... certain "concessions have to be made. John Rook and Hit Parade Radio are running into some of the same obstacles. By trying to reach an audience both on the Internet and Wi-Fi ... as well as securing a stable of AM and FM radio stations across the country ... he's had to compromise some of HIS programming ideas in an effort to please the "majority". But John has taken an aggressive approach to programming his station. Whereas MOST oldies stations have a library of about 250 - 300 songs ... and even some of the BEST ones top out right around 750 - 800 titles ... Hit Parade Radio is programming over 3000 oldies ... in theory, they wouldn't have to repeat a single song all week long ... and it's been that CONSTANT repetition that has driven even some of the most die-hard oldies fans away from conventional radio. In this economic climate, when companies in all walks of life are closing their doors left and right ... and MAJOR radio corporations are filing bankruptcy and shutting down stations ... starting and marketing a brand new radio venture HAS to be considered more than just a little bit risky ... some might even say crazy. But what Rook and Lujack and Martindale bring to the table is close to 150 years of accumulative experience behind them of when radio was done right ... a proven track record ... and they're going after a target audience demographic that has been largely ignored by conventional radio for far too long. Think THAT isn't an obstacle??? It HAS to be, especially when trying to sell the idea to some executives that probably weren't even born yet during this radio hey-day ... and there have also been any number of unexpected set-backs along the way, too ... but despite it all, they've persevered ... and are as anxious to bring this format to the listeners as WE are to hear something fresh and exciting again. Believe me when I say that we're ALL anxiously waiting to hear Larry Lujack on the air again. But will we ever hear Lujack doing a regular radio program on Hit Parade Radio? I'm not so sure we will ... not in the traditional four or five hour weekday morning stint anyway. Keep in mind that Hit Parade Radio will be syndicated around the country. If Larry WAS going to do a 5 am show (and, at this stage of his career, I personally can't even IMAGINE that Lujack would want to get up early enough to do a 5 am show every morning anymore, although he DID do that here in Chi-Town as part of the short-lived "Real Oldies" venture), WHICH 5 am would you be talking about? 5 am East Coast Time? 5 am West Coast Time? These are factors that the average listener doesn't even take into consideration. A far BETTER strategy might be to sprinkle both Larry Lujack and Wink Martindale in small vignettes throughout the whole day ... that way they'd be available 24 / 7 ... whenever people tune in, meaning that you'll be likely to catch SOMETHING featuring these two "flagship" guys on the station no matter WHEN you turned on Hit Parade Radio. True, this falls back into more of the same "syndication / automation" syndrome that we keep harping about ... and we truly do miss the "live" spontaneity that a REAL radio broadcast has to offer ... but at least INITIALLY this set up would allow their talents to be far better utilized by spreading them out throughout the day, a marketing strategy that should serve Hit Parade Radio well during the initial phase of reaching listeners worldwide. Perhaps eventually things will settle into more of a format that would allow Wink or Larry to do a four-hour show at a set time period every day ... "appointment radio" if you will ... but moving forward with the current goal of getting everything up and running by the first quarter of 2010, Priority One for the Powers That Be is to make Hit Parade Radio available not only through their current Internet and Wi-Fi connections, but ALSO on a selection of local AM and FM radio stations across the country in the very near future as well ... and the recent addition of Liz Doyle, a long-time affiliates executive with Citadel, should help make this transition much more likely. We wish him continued success in bringing this station to the people and providing a chance to hear some music that has been absent from the radio airwaves for decades now. No, you won't hear a lot of "hard rock" on Hit Parade Radio ... there are already plenty of other stations for that if this is what you're looking for. Thank you, Kent, for your encouragement and the great job you and your contributors do in keeping interests alive for those Forgotten Hits ... that shouldn’t be. And thank you for sharing the memories of radio when. There is, without question, a feeling that the listener has "dumbed down" to a point where what's on "in the background" really doesn't matter anymore ... that's because the average listener is most likely "multi-tasking" ... on the computer with the TV softly muted, all the while sitting in their easy chair with the headphones to their iPod firmly planted in each ear. We just don't seem to have the attention span we used to have when life moved along at a slower pace ... and there weren't so many distractions all around us. But it's ALSO because nobody's been giving us much worth watching or listening to lately! We see this trend in virtually EVERY type of entertainment that's brought into our homes. That's why there's so much "disposable" television programming going on these days ... a television program like one of OUR favorites, "Lost", has a very specific, hard-core audience ... a lot of folks simply won't go for a program like this because it requires TOO much attention ... you have to actually THINK about what's going on from episode to episode and a lot of folks simply aren't used to doing that anymore ... there's a committment involved! As such, a number of viewers have switched off, finding themselves "lost", too, by missing a key scene or revelation here and there. Radio USED to be like that, too ... we hung on every word, WONDERING what the jock was going to say or do next ... we couldn't WAIT to hear the hot new music coming out of our little transistors ... heck, we'd put the radio under our pillows at night because we didn't want to miss a thing. Sadly, today's generation will NEVER know this excitement ... because we've "dumbed down" to the lowest common denominator ... and that's a shame. All we hear today from these know-it-all consultants is "That Won't Work" ... completely forgetting the fact that it worked just fine for DECADES. (Then again, maybe a big part of the problem is that there hasn't been all that much to get excited about musically lately!!! We've conditioned ourselves not to get too excited about what will only end up being "last week's news" or this week's "Flavor Of The Month." We've spent so much time re-inventing the wheel that we seem to have forgotten what made the wheel (rock and) roll in the first place! So much time and effort has been spent in cutting costs (and corners) through automation that MOST radio today is devoid of ANY sense of personality and interaction with the listener. To a degree, our greatest fears have been realized ... our lives are now being programmed by a computer! THEY'VE decided what we're supposed to like and not like ... what we hear and what we don't hear. This is why we hear something like "Stand By Me" or "Born To Be Wild" half a dozen times a day in literally EVERY city in the country. In THEIR minds, this is all we can handle. But the fact is, those of us with half a brain ... those of us who like to think for ourselves ... have tuned out or given up. That's because we've reached a point where WE can program a day's worth of musical entertainment into our lives better than THEY can!!! And we now have the means to do so, thanks to things like iPods and CD burners and computers and the Internet. And let's face it ... the criteria has changed a little bit, too ... we don't NEED the news at the top of the hour anymore ... if you want to hear the news, you can simply tune in to any one of half a dozen news-only channels now available. Want the weather? Switch over to the weather channel ... same with traffic ... or sports. Like talk? There are dozens of THOSE out there, too. Want music ONLY ... yep, just head on over to the Internet and you'll find nothing but music. It's ALL there ... segregated and streamlined to your little heart's content. What seems to be MISSING is the personality-driven radio that we all grew up on ... we've been so programmed (or is that DE-programmed) to think that the jocks don't have anything worthwhile to say, that we don't want anything more than time, temp and music ... you can literally get a ROBOT to give you that ... and, in effect, that's EXACTLY what we're getting these days ... a "robotic", pre-recorded, voice-tracked program devoid of ANYTHING remotely resembling personality. This seems to be fine for some ... and, for many, it's all they know ... but those of us who grew up on radio know better. 12 - 30 - 66 ... and 4 - 28 - 67!! !